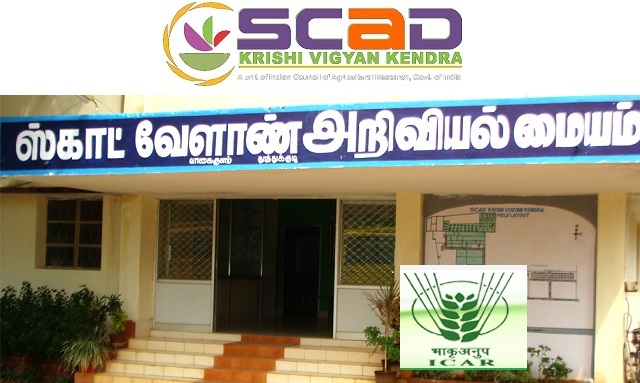 Krishi Vigyan Kendra - SCAD KVK Thoothukudi Recruitment 2018 2019 Application Form for 04 Stenographer, Subject Matter Specialist, Senior Scientist and Head Posts Download Application through Official website www.scadkvk.org. SCAD KVK Thoothukudi Stenographer Jobs Notification 2018 Released. The Interested Candidates are requested to Download Application through Official website www.scadkvk.org. The last date for submission of applications is 31.03.2018.SCAD KVK Thoothukudi Recruitment 2018 || 12th, Master Degree - Apply Now. Hard Copies of the signed application (registered online) along with photocopies of (i) ID proof (ii) Proof of Date of Birth (iii) Educational Certificates: Mark-Sheets/Degree Certificate (iv) Caste and attested copies of relevant documents should be addressed to “Chairman Social Change And Development (SCAD) – Krishi Vigyan Kendra Mudivaithanendal Post, Vagaikulam, Thoothukudi Tamilnadu - 628102” by post so as to reach us by 31.03.2018.